Source: The New York Times. January 6, 1889. Page 16. Another decision was given yesterday in the celebrated barn-burning case of Alexander Mead against David S. Husted, which has occupied the courts of Connecticut for the last 10 years. The decision was in Mr. Mead's favor, and he came to New York yesterday afternoon with his ruddy face wreathed in smiles and his right arm burdened with a huge volume of the many and various court proceedings. He had had four barns burned and then he quit building them, not only because it was almost a certainty that any new structure would meet the fate of its predecessors, but because his series of misfortunates had become famous in insurance circles, and he found it impossible to obtain fire insurance on anything he possessed. Mr. Mead's first barn was burned in 1875. It was a large structure, situated on his place in Greenwich, Conn., and was filled with hay and grain. While the barn was on fire a young lady of the neighborhood saw David S. Husted standing in a celler across the street from the burning building, watching the fire. That same year, but prior to the burning of Mead's barn, Husted had been arrested by the Glen Falls Insurance Company for obtaining money under false pretenses. He had built a new house, which was burned almost as soon as it was insured in the Glen Falls Company. The latter had Husted confined in the Glen Falls Jail until he paid back all the moneys received from the insurance company. When Husted was released from prison it was reported to Mead that Husted blamed Mead for the action of the insurance company and had sworn vengeance. To this Mead paid so little attention that he built another large barn in 1876 and it stored it with all kinds of crops. In March, 1877, this barn was likewise destroyed by fire. Mead had his suspicions, but he was still in need of a barn and therefore proceeded to a erect another structure on the site of the old one. In January, 1879, this barn was burned, with 27 head of cattle and a large amount of grain, farming implements, etc. Mead then determined to do something for his own protection, and acting, under the advice of George H. Watrous of New Haven, he began a suit for $20,000 damages against Husted and attached the latter's farm for that amount. The case was brought to trial in 1880, but the evidence bearing on the burning of the barn in 1875 was ruled out under the Statute of Limitation. Mead appealed from this decision to the Supreme Court of Errors and a new trial was granted with the admission of the 1875 evidence. 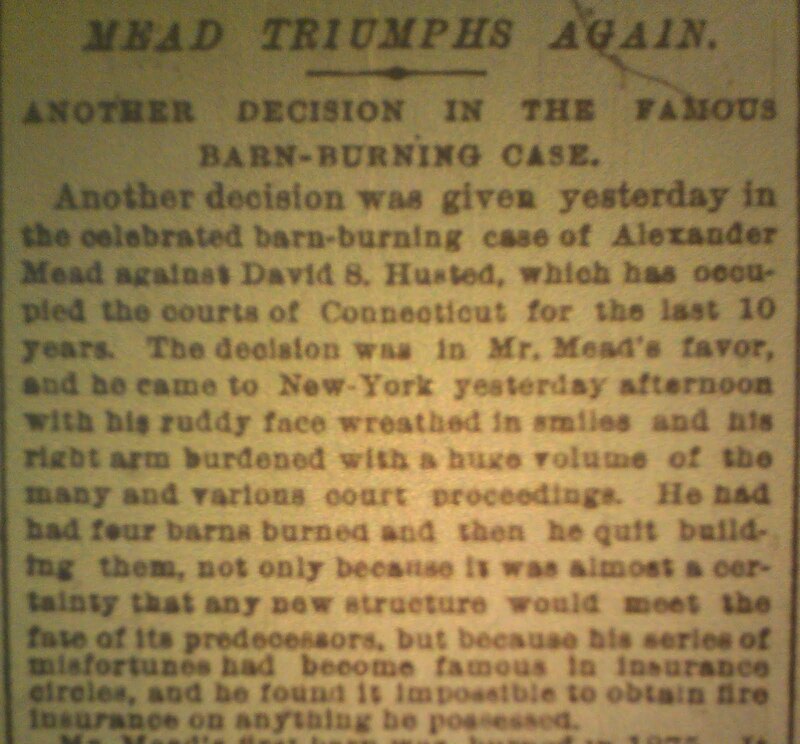 The second trial was held before a jury in Bridgeport in 1883, and it was testified that Husted had openly threatened to burn down Mead's barns until Mead should suffer a loss equal in amount to the sum of money that Husted had been compelled to pay back to the Glen Falls Insurance Company. The jury disagreed, but the case was brought to a fresh trial at Danbury in the Fall of the same year. On the trial Mead obtained a judgment of $5000 in costs against Husted. The latter appealed to the Supreme Court for a new trial, but the appeal was denied. Then Mead attached Husted's farm and recovered $6,000 as the total of the judgment. In the meantime Mead had built a fourth barn, despite the fact that he could obtain no insurance on the building, and this was also burned in 1884. The town of Greenwich and became thoroughly aroused, and offered a reward of $2000 for the detection of the guilty party. Nothing came of this, although several New York detectives undertook to ferret out the criminal. Nevertheless, Mead began a civil suit against Husted for the value of this barn and again attached his farm. At this Husted asked for new trial of the first case on the ground of newly discovered evidence, which was granted last March by Judge Torrence of the Superior Court. From this decision Mead appealed to the Supreme Court and the case was tried last October on the appeal. Yesterday a decision was rendered refusing a new trial to Husted. This leaves Mead in possession of the $6000 judgment already obtained and clears the way for a trial of his suit for $7000 damage for the barn burned in 1884. He is determined to press this suit immediately. One of the most notable bits of evidence in the great volume elicited by these barn-burning trials is the story that one Alfred Dyckman, a devout Methodist of Greenwich, prayed that the man who burned Mead's barn might be paralyzed. It was gravely told in court but the following morning after this prayer was uttered Husted had a fit.